Uncharted Golden Abyss is the best reason, but certainly not the only one, to buy Sony's still-codenamed Next Generation Portable. It is a game that delivers what you'd expect from a console, it cuts no corners, offers no excuses. This is gaming on the go without the need to make do. This is the reason you'd want to carry around something that is made for gaming, rather than something that is merely able to play games. My first moments with Sony's NGP at a press event last month weren't spent playing Uncharted Golden Abyss, but it was Golden Abyss that made me a true believer in the importance of dual-thumbstick portable gaming. Back when Uncharted was shown to Brian Ashcraft in Japan, following the unveiling of the NGP, the already impressive game was just a tech demo, Sony Worldwide Studios VP Scott Rohde told a gathering of press last week. Much has been added and changed since that early look. Golden Abyss is a brand new Uncharted game, he said, that takes place before Drake's Fortune. It is not a prequel, he said, it is a stand alone story, one that takes more than two hours of cut-scenes to tell. 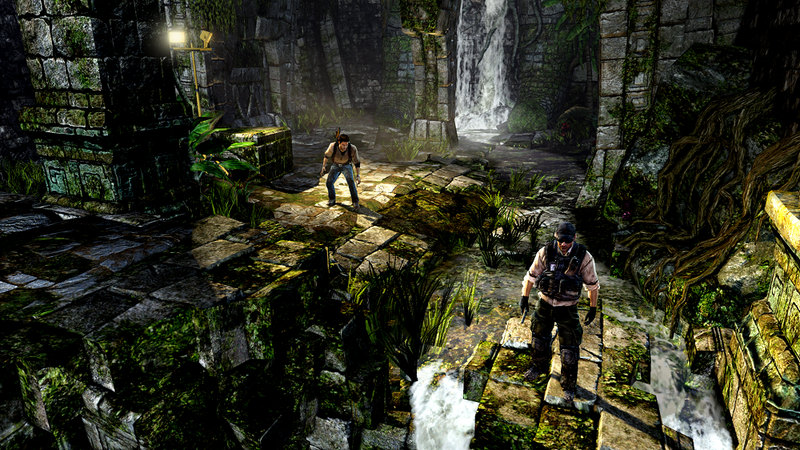 The game was created using the same motion capture techniques used on Uncharted 2 and Uncharted 3, Rohde said. The NGP even allows for real-time lighting and advanced shaders. While the graphics are impressive, stunning even, developers Bend Studio were sure to put in as much work on the story and gameplay as they did the graphics. That's because the NGP has some interesting ways to play games. It has those two glorious thumbsticks, a touch screen on the front and a touchpad on the back and can detect motion. We watch as Drake approaches a guard standing by a cliff in a lush jungle near the remains of the Temple of Serpents. An icon bar pops up on the screen close to the thumbsticks showing buttons and swipe symbols. Touching one knocks the guard from his roost. It also allows Drake to quickly change weapons and pick items up. Later we see Drake climbing across a cliff face, when he gets to a crevice. Tilting the NGP causes Drake to lean and reach out toward the opposing cliff. Tapping that cliff causes Drake to jump. When Drake arrives at a set of wooden posts jutting from the side of the cliff, sliding your finger across the posts causes Drake to monkey-bar his way along cliff. The good news? You don't have to use the touchscreen to play, it's an option. The better news? You'll still probably want to because it works. As Rohde explains this we watch Drake climb under a guard, a tap of the screen has him pull the enemy from the cliff. A few minutes later Drake sneaks up behind another guard, tapping the guard causes Drake to kill him silently. Later I get a chance to play the game. The NGP feels slightly big in my hands, thicker then I expected. But I soon forget that as I stared into the crisp 5-inch OLED screen. Rohde told us that the game has four times the resolution of the Playstation Portable, that the game displays 260,000 polygons per a frame. None of that registers though as I sink into the familiar experience of guiding Drake through another jungle, on an adventure for some unknown prize. In the distance I see man walking across the remains of a temple. I crouch Drake behind a low wall and then use the thumbsticks to position him and pop off some headshots. The controls are solid, not just reminiscent of a Playstation 3 controller, but seemingly matching one. Moving and firing, too, is effortless. I shift between cover, run to new hiding spots, all while firing off shots at enemies who are now returning fire. None of it is a struggle. None of it frustrates my aim, or intent. And then there are the improvements. Using the touchscreen to toss the grenade is a joy. I just switch to a grenade, and then touch and drag to the exact spot I want Drake to toss the explosive. Sniping is a bit of a challenge, requiring players to use the motion sensing of the NGP when zoomed in to aim, but the balance between effort and reward seems just right. Uncharted Golden Abyss certainly isn't the sort of first-person shooter experience that will completely stress test the abilities of the NGP's dual thumbsticks, that will have to wait for a Battlefield or Call of Duty, but it requires enough shooting and moving to prove what gamers have been saying for years: Shooters just don't work with a single thumbstick.